The Financial Instability Hypothesis is complex, and so I am splitting the concept into two parts. The first part is a discussion of the evolution of the behaviour of borrowers. The second is the evolution of the financial system, a discussion that will be deferred to a later article. Although these are linked, it is simpler to discuss them separately. My discussion here leans heavily on Chapter 3 of the book Why Minsky Matters: An Introduction to the Work of a Maverick Economist by L. Randall Wray. [i] If one wants to read Minsky’s original text, the book Can “It” Happen Again? Essays on Instability and Finance[ii] has multiple essays on the subject. 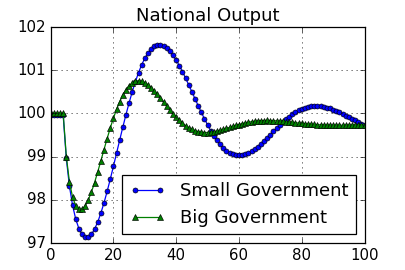 Whereas that model [the accelerator model] at least allowed for instability, the problem was that it was too unstable: gross domestic product (GDP) could shoot off toward infinity or toward zero, depending on assumptions. I was not completely satisfied with the formal models used by Minsky, for reasons such as the above. My preference is to use a stock-flow consistent (SFC) model that will generate the investment multiplier effect, as done in an earlier article (link). Since the modelling technique used is a hybrid based on the work of a number of heterodox authors, a historian of economic thought could argue that my presentation is not purely Minsky’s theory. [iii] In any event, Minsky viewed his work as an interpretation of Keynes (that Keynes was not able to make clear before his death), and his theory evolved as he incorporated other post-Keynesian concepts (such as the Kalecki profit equation). Having covered the explanation as to why the economy is sort-of stable, we can then turn to the source of instability that Minsky identified. This is the famous hedge-speculative-Ponzi borrower spectrum that he defined. A hedge borrower borrows in such a fashion that expected cash flows would cover all required payment flows from borrowing. Currently, the best example of such borrowers would be households that have long-dated amortising mortgages that should be extinguished under the assumption of continued employment. A Ponzi borrower (named after the early financial engineer, Charles Ponzi) is a borrower that has a net present value of cash flows that is less than the net present value of expected income. Unless the borrowing is done on a fraudulent basis (which can happen), this only makes sense if there is an expectation of rising asset prices, rising income from the assets, or falling interest rates. My feeling is that the normal practice would be to bury these optimistic assumptions into expected value, and so the borrower would be classified as speculative. However, if one extrapolates current income forward, we would end up with borrowers slipping from speculative to Ponzi because extrapolated current income is below actual expectations. Such a simple extrapolation scheme might be used in an economic model. As my description suggests, most corporate borrowing would fall in the speculative category if we looked at the cash flow estimates used by borrowers and lenders. Sub-prime residential lending in the United States before the Financial Crisis acts as a real world example of Ponzi borrowing. The premise behind the more plausible versions of these loans (some categories of sub-prime lending made no sense) was that the borrower had a bad credit rating that could be improved after demonstrating a history of meeting the mortgage payments. After a few years, the improvement in the credit rating would allow a refinancing into a conventional mortgage at a lower interest rate, converting the form of finance to hedge financing. Meanwhile, the lender was supposed to be protected by the assumed rise in house prices in aggregate (since lenders had portfolios that were diversified geographically). That lending strategy worked – until it didn’t. Once this categorisation is set, we then return to the Financial Instability Hypothesis. Minsky’s argument was that lending and borrowing standards are set by conventions, and those conventions vary over time. Assume that we start out with very cautious lenders and borrowers (which was the case after the Great Depression and World War II). The bulk of borrowers fall into the hedge category or possibly speculative. However, assume that the economy grows steadily, and businesses are generally successful. The firms that used more leverage will end up with a higher rate of return on assets, and they repaid their loans. All agents will revise their views about borrowing conventions, and decide that the standards used to evaluate the relatively higher risk borrowers were actually adequately safe. Therefore, standards are loosened progressively. This is not just an issue of psychology, there is an evolutionary aspect. Firms that expand faster by using leverage – or lenders that had looser lending standards – will push out stodgier firms by outperforming. So even if regulators and some banking personnel try pushing back against loosening lending standards, they are pushing against economic outcomes. Furthermore, the act of debt-driven expansion is self-reinforcing. We can see this from the Kalecki profit equation – which Minsky worked into his theory over time. Rising investment raises profits. In addition, Minsky worked with a “two price” system: output for current output was priced as a markup over costs (which is usual for post-Keynesians), but assets that could be held through time. The value of these assets depends on highly uncertain future profits. If things go well, optimism about the future rises – as does the expected value of the assets. As such, the demand for investment goods rises. The most natural way to formalise this theory is via an agent-based model. We simulate the economy by having a large number of “agents” that act independently. We make the willingness to take on leverage vary across agents, and see whether the economy becomes dominated by the agents with the least aversion to risk. The 2011 paper by Chiarella and Di Guilmi[v] provides an example of this approach. In their approach, they have a large number of firms, and the firms jump between two modes of financing (corresponding to speculative and Ponzi financing). The mix of hedge, speculative, and Ponzi finance in existence at any time reflects the history of the economy and the effects of historical of the economy and the effect of historical developments upon the state of long-term expectations…. If we want to stick to aggregated models, we either need to have a drift in parameter values motivated by these arguments, or we could split some of the aggregates into sub-groups that pursue different levels of leverage. Since national accounts data are not organised in this fashion, only the aggregated data generated by the model could be compared to real world data. If the belief that the more leveraged firms will expand faster were correct, the aggregate would drift towards higher leverage. However, this understates the effect, as behavioural patterns can shift, and previously low-risk firms decide to join the high-risk group. Such behavioural changes can only be easily dealt with in an agent-based model. The acceptance of Minsky’s theory to a certain extent depends upon one’s willingness to accept agent-based models or using qualitative arguments to explain a drift in behavioural parameters. The neoclassical preference was for behavioural parameters that are fixed, hence his theories were not embraced (until the Financial Crisis shook up macroeconomics). [vii] Since I have no strong objections to model parameters drifting in this fashion, I do not see a need to chase after agent-based modelling techniques to formalise the theory. If we accept the Financial Instability Hypothesis, it is not hard to see how a recession develops. The propensity to invest using borrowed money rises over time for both businesses and households. Previous successes validate previous borrowing. However, the reduction in the margins of safety means that some borrowers hit cash problems – either due to some “external shock” disrupting their plans, or a speculative expansion was not economically justified. These localised failures create expenditure cutbacks that then ripple through the system. A downward spiral in activity starts, which is only arrested by the various stabilisers in the system (automatic stabilisers that are the result of government policy or the structure of capitalism, or discretionary counter-cyclical policies). One way to summarise the Financial Instability Hypothesis is that stability is destabilising. An environment with low economic volatility allows higher risk agents to validate their borrowing plans – causing borrowing to drift in a more aggressive direction. Empirically, the story appears to fit the observed data. Unfortunately, an in-depth analysis would require access to detailed statistics on the composition of debt markets. We could look at debt outstanding (which are available in flow of funds data), but those data are affected by the level of interest rates and income levels. The figure above is one of the few sources in the public domain that is suited for our purposes. It depicts the mortgage servicing cost as a percentage of disposable income for U.S. consumers. The chart starts in 1980 – the point in time where ultra-high interest rates were used to crush inflation. This dampened “animal spirits” in mortgage borrowing, but those recovered during the 1980s. 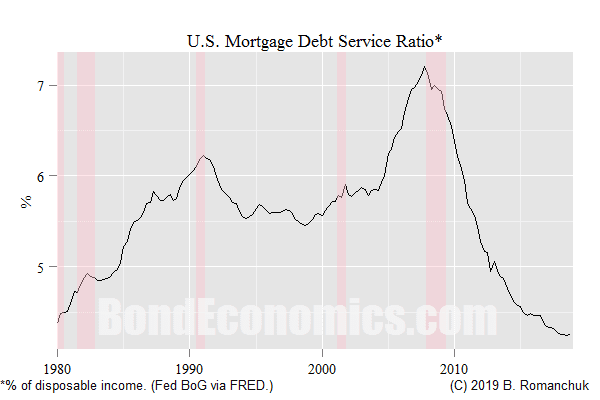 Mortgage debt service levels rose until the recession of the early 1990s – a recession that was associated with regional housing bear markets and the Savings and Loan Crisis. During the 1990s, the debt service ratio was stable, partly courtesy to falling interest rates and financial innovations. During that era, increased competition among mortgage lenders (and technological efficiency improvements) made refinancing of conventional 30-year mortgages in response to lower mortgage rates common. (The author is unaware of other countries that allow refinancing on such advantageous terms for consumers.) However, the gains from falling interest rates were largely spent by the mid-2000s, while mortgage borrowing and lending became increasingly aggressive. As is well known, this came to an end during the Financial Crisis, and mortgage servicing dropped to the early 1980s levels. As my qualitative story indicates, we cannot rely on mechanical models that assume unchanged behavioural patterns; historical events modify behaviour. As Minsky’s historical analysis noted, the Great Depression damped risk-taking behaviour for decades. This data set does not go as far back, but we can infer behavioural pattern changes after the Savings and Loan Crisis and the Financial Crisis. In order to delve further into disruptions to the cycle, we need to look at the evolution of the financial system, which is discussed in the next article. In conclusion, if we want to formalise the Financial Instability Hypothesis, the most natural way would be to look at agent-based models. However, if one is willing to be somewhat less formal, we can interpret it through an investment-accelerator model with drifting behavioural parameters, much like Minsky did. Link to Part II (financial evolution). The question arises: is it reasonable to draw a connection between Minsky’s arguments and a more formal agent-based model? I would argue that it is. Let us assume that we have disaggregated the business sector into N firms, each with different behavioural parameters, based on where they fit in the hedge-speculative-Ponzi spectrum. Let us assume that the model is set up so that the key behavioural parameter is the propensity to borrow to finance fixed investment. (In many models, this would actually be two decisions: the propensity to invest, and how to finance fixed investment. For simplicity, let us collapse that to a single parameter.) If we assume that we are in an expansion, and no firms fail, aggregate behaviour is the sum (or weighted average, depending on the variable) of the individual firms’ behaviour. As such, the weighted size of each behavioural type will determine the observed propensity to borrow to invest. We know from microeconomic principles that if the firms are profitable, the more-leveraged firms will have a greater return on equity, and will grow faster (since they access more borrowed capital). Therefore, the observed aggregate weightings will shift towards to a higher propensity to borrow. (Such a shift matches the quoted discussion by Minsky). It is not until we hit firm failures (presumably in a recession) that the riskier firms will be culled, returning the propensity to borrow to a more conservative level. Although this argument relies on some strong assumptions (e.g., no failures within the expansion), it seems obvious enough that it is not worthwhile spending too much time trying to formalise the argument. An alternate way of looking at the previous discussion is that the borrower evolution side of the Financial Instability Hypothesis is an emergent property of agent-based models. We just need two properties. Firstly, the model aggregates into something resembling an investment-accelerator model. (I would argue that this is necessary for a “plausible” model, as it is implied by accounting identities, the Kalecki Profit equation, and “stylised facts” about investment behaviour). The next property is that we should expect business failures to be clustered around recessions – a behaviour that matches another stylised fact about bankruptcy statistics. i Why Minsky Matters: An Introduction to the Work of a Maverick Economist by L. Randall Wray, Princeton University Press, 2016. ISBN: 978-0-691-15912-6.
ii Can “It” Happen Again? Essays on Instability and Finance, by Hyman P. Minsky, M.E. Sharpe, Inc., 1984. ISBN: 0-87332-213-4.
iii My accelerator model would even be more problematic as I used some neoclassical-looking modelling choices as shortcuts to simplify price determination. v Chiarella, Carl, and Corrado Di Guilmi. “The financial instability hypothesis: A stochastic microfoundation framework.” Journal of Economic Dynamics and Control 35.8 (2011): 1151-1171.
vi Found on page 106 of Can It Happen Again? by Hyman P. Minsky (book information given earlier). vii This preference is justifiable if one wants to build a model that can be fit to data; if the parameters are moving, we cannot hope to estimate their values using econometric techniques. However, my argument is that since we expect such models will not fit the data in the first place, the inability to use econometric techniques is the least of our worries.